In the late 1960s, Juan Perez was a college student in Puerto Rico studying to be an engineer. A close friend was about to graduate and his mother bought him a new 1967 Triumph TR4A as a gift. For several months Perez and his buddy spent many a mile in the sports car. 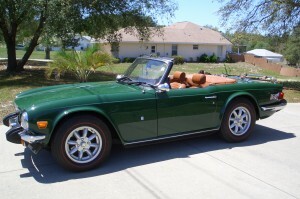 After Perez graduated he purchased a used Triumph TR4. Unfortunately, it had been wrecked and had not been properly repaired, so Perez sold the TR4 before eventually moving to the United States in 1983, landing a job in Chicago. Perez began shopping for another Triumph. This time he got a good used one, a 1975 TR6. He had a trusted Triumph mechanic give the car a thorough examination. For years thereafter he had the same mechanic service the car. In the mid-1990s the Triumph was in the shop for regular maintenance. That is when a man entered the garage with his young daughter in search of a good used Triumph. The girl looked at all of the Triumphs available for sale, but the car that captured her attention was the one Perez owned. The mechanic telephoned Perez to ask if his Triumph was available. For the right price Perez replied. 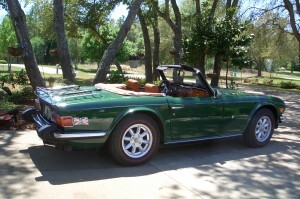 He got a good price for his 1975 car and soon after he purchased from his mechanic an even better Triumph, a 1976 TR6. It had been driven only 28,000 miles. Perez retired in 1998 and enjoyed his TR6 only during the good weather months in Illinois. The car spent many months in a garage, sheltered from the ravages of winter weather. In 2001, Perez secured his 13-foot, 7.5-inch-long TR6 on a trailer and moved to Michigan. Once there he had his TR6 reupholstered in a tan interior. When the car was stripped bare Perez was happy to find no sign of rust and no evidence of any structural damage. All of the brightwork on the car was removed and the Triumph was resprayed in British Racing Green. A new grille was installed, but most of the original trim pieces were salvageable and were reinstalled. The soft convertible top is black and the optional hard top is painted to match the body color. By 2004, Perez decided that Michigan wasn’t any warmer than Illinois. “There are not many sunny days there,” he observes. Once again he loaded his Triumph on a trailer and towed it as he relocated to Pine Ridge in Beverly Hills, Fla. Perez says his TR6 has traveled many miles, but usually on a trailer. “It hasn’t seen a lot of road,” he says. On the functional, no nonsense, dashboard, nestled among all the smaller gauges, is the 140-mph speedometer and a 7,000-rpm tachometer with a redline of 5,700 rpm. Perez admits to driving his car only up to 70 mph. The inline six-cylinder engine, Perez says, originally was fed fuel by a pair of S.U. carburetors, but they have been replaced by two Stromberg models, which drink from the 11.4-gallon gasoline tank. The 152-cubic-inch engine has a 7.5-to-1 compression ratio. Perez has new 15-inch wheels and tires that support the 2,438-pound empty weight of the car on an 88-inch wheelbase. The car is only 58 inches wide — less than 5 feet — which makes for a cozy cockpit. However, the Triumph can be turned around in a mere 34 feet. “It’s nimble enough to make it fun,” Perez says. As low as the car is it still has an impressive ground clearance of 6 inches. Since moving to Florida, Perez has driven his 1976 Triumph TR6 sparingly, with the longest trip taken being about 70 miles to Gainesville, Fla. The Triumph has a luggage rack atop the trunk lid to augment the limited amount of cargo space inside the trunk. “I have the straps to tie down luggage on the rack,” he says.